In 3 short weeks, the FPD Elementary students will present their annual Christmas program! This year's theme is "Christmas in Central Park." The students are children at a neighborhood Christmas party where the snow is falling and the music is rocking! We will present two shows on Thursday, December 10th at 1pm and 7pm. Below are two video previews of some of the songs the students are working on. 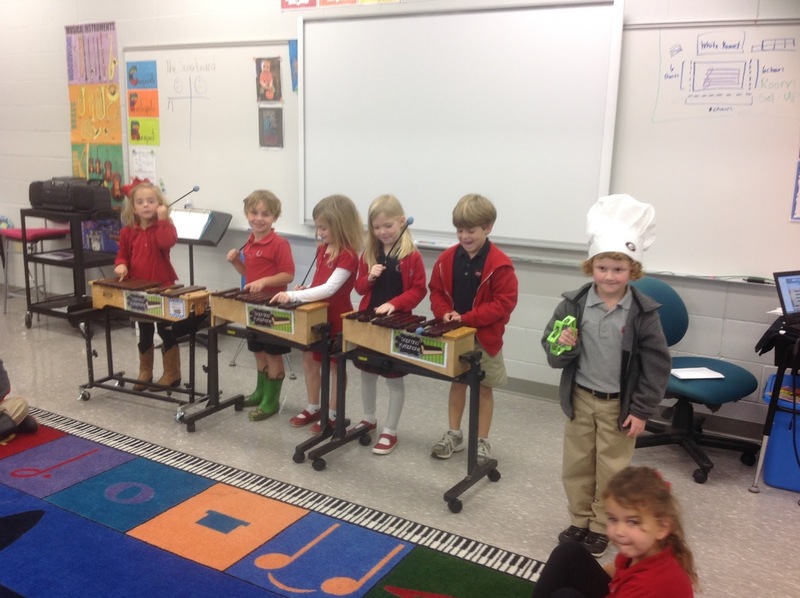 The 3rd graders added the Stick Stations to a traditional carol from Sussex, England. The 4th graders have been working hard to learn "Coventry Carol" on their recorders. Enjoy these "sneak peeks," and be sure to join us on December 10th! Preview of our "Christmas in Central Park" backdrop! 4th Grade recorders on "Coventry Carol"
In Kindergarten and PreK this week we are starting to celebrate Thanksgiving through some fun turkey songs. We learned a song called "Five Smart Turkeys" about five turkeys who evade the cook by hiding in a tree. We used our imaginations to act out the story of the song. Then, we added in the instruments! The five "turkeys" got to play on the soprano xylophones. This was our first exposure to playing on the barred instruments! 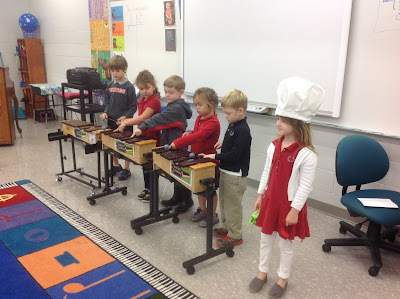 We used the note F on the xylophones. The students played an F on each of the rhyming words in the song--we, tree, and see. We talked about mallet rest position (on our shoulders) and bouncing the mallet on the "belly button" of the bar for the best sound. Below are some pictures and videos of a Kindergarten class in action! The practice session before the song! Click the envelope to send me an email!